. His book is now a bestseller and he once said "I am the only homeless man on the New York Times Bestseller list! " He asked that we pray for him so that he and his family can find a new home after Hurricane Katrina. known as the "Phoenix Five" because they are the five young nuns from Hansville chosen to start a monastery in Phoenix upon the invitation of Bishop Thomas J. Olmstead of the Diocese of Phoenix. 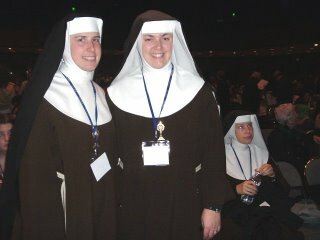 Here in this photo are Sr. Esther Marie and Sr. Marie St. Paul. Sr. Marie Andre is in the background. They are beautiful cloistered nuns who received a special dispensation from the Bishop to attend the anniversary celebration. Although this was part of their work of evangelization, they said they could not wait to go back home to the monastery to be with Jesus. What a beautiful witness to the world. OH poor Raymond! I will pray that he finds a home and his book sounds like an interesting read for my flight to the USA, I need to keep myself entertained, so what better excuse to buy a new book! 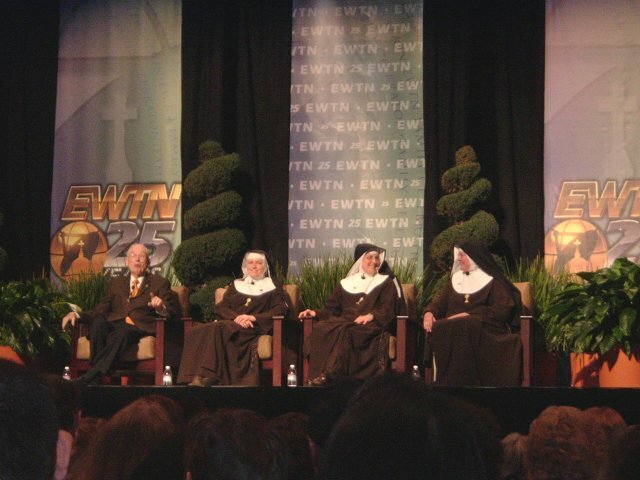 God bless EWTN! I have only in the past year discovered them. I love EWTN! All Catholic-All the time!! I was watching it before I decided to become Catholic. Mother Angelica is great! Carmel, you are in for the Catholic time of your life! Danny obviously knows! EWTN rocks! Thank you for these links. I am planning on becoming a priest, so I will certainly look at the link you provided near the end. You have a great blog. It's my honor to nominate you for the Catholic Blog Awards for Most Informative Blog. Moneybags, thank you so much! I deeply appreciate your vote of confidence. Any honor due to this blog is given to Our Lady for it is consecrated to her. I am so happy to hear of your plans to become a priest. We need holy priests! May the Lord Jesus bless you abundantly and may you be His special son that you may be His light for the whole world! I shall keep you in my prayers. Carmel, yes that a great idea about reading the book in flight to the USA. I bet you'll finish it before you land! Danny,EWTN has been instrumental in my own formation as a lay person. Do you watch Journey Home with Mark Grodi? They invite converts to Catholicism. Perhaps one day you can be a guest! Anonymous - Amen! 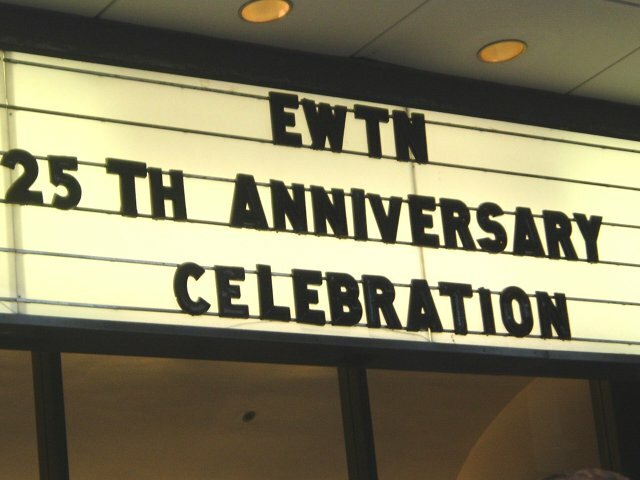 EWTN rocks! The Catholic world owes much to Mother Angelica's EWTN. With all the false prophets these post VatII years, where would we be? Though we would certainly know that their voices were not of our Shepherd, where would have found affirmation? 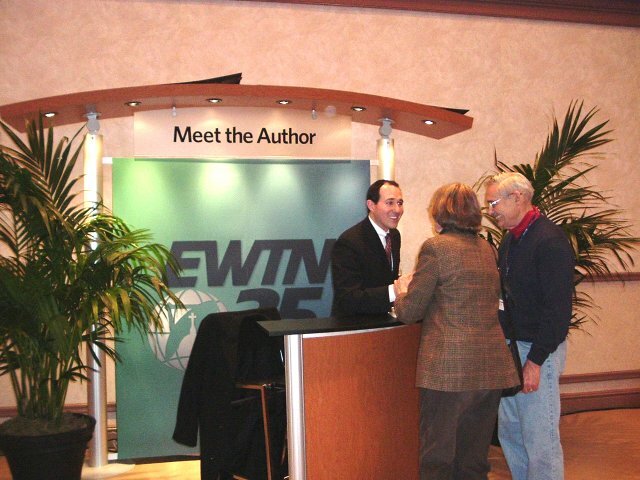 EWTN is the true face of The Church. This beacon of Light has shepherded home countless numbers of converts and reverts as well. It is with JOY that I rush to mail in my monthly support. Wow Patte, that's so true! EWTN is such a great blessing to the Catholic Church! Your monthly envelope is a gift that will help save souls! Thank you, St. Peter's Helper. That is precisely my goal - to be a beacon of light. I wish for it not to be my light but rather Christ's light through me. I would greatly appreciate your prayers. Right now I'm trying to find information on different seminaries across the US but have found little so far. EWTN is wonderful. I loved being able to watch it when I was in Ukraine as well. May God bless them with many many more years! Moneybags, how do we nominate? I would like to nominate St.P's helpers too! Angela Louise, I didn't know EWTN was aired in Ukraine. Wow, that's fantastic! God bless you and praying for you as you discern for religious life. Carmel, you are so very kind. God bless you! I'll post the link so you can vote for your other favorite blogs. There are so many outstanding blogs out there. A visit from friends like you who love Jesus, is already a great reward.